Background: Fragile X syndrome (FXS) is also a leading cause of intellectual disability along with Down's syndrome. It is caused by the expansion of CGG triplet repeat at 5' untranslated region of the fragile X mental retardation 1 (FMR1) gene. Since the prevalence rate is quite high in the general population, molecular diagnosis is important to establish the cause and the prenatal diagnosis. At present, there are a number of methods available with their own merits and demerits. Aim and Methods: Molecular screening of intellectually disabled patients and those with premature ovarian failure with combined triplet repeat primed polymerase chain reaction (TP-PCR) and methylation-specific polymerase chain reaction (MS-PCR) for establishing the diagnosis of FXS. Results: The specificity of the method has been validated with archived previously genotyped samples, facilitating the application of this method in the screening procedure. The combined TP-PCR and MS-PCR approach identified six (10%) of the intellectually disabled cases as full mutation positive, one (4%) of the premature ovarian failure cases as premutation positive, and one (out of two) of the prenatal samples as premutation positive. Conclusion: The present study concludes that a combined usage of TP-PCR and MS-PCR will be a useful alternative approach to diagnose patients suffering from fragile X syndrome. Fragile X syndrome (FXS, OMIM 300624) is a clinically heterogeneous disorder caused by expanded CGG triplet repeat at 5' untranslated region (5'UTR) of the FMR1 gene. It is the most common inherited cause of mental retardation with a prevalence of 1/4000, for male and 1/8000 for female subjects., The clinical features are subtle until puberty and the patients may develop features such as a long face with a prominent mandible, large ears, and macroorchidism. Male patients are more severely affected when compared to the female ones, and profound mental retardation is usually found in male patients. If cytosine-guanine-guanine (CGG) repeat number exceeds two hundred, it silences the FMR1 gene expression., FMR1 gene encodes the protein, fragile X mental retardation protein 1(FMRP1), that is crucial for synaptic plasticity and regulation of synaptic proteins. Individuals with >200 repeats are identified as those having a 'full mutation' stage and will exhibit the phenotype. The repeat range of 55–200 was identified as the 'premutation' stage. Premutation individuals are asymptomatic and may develop fragile X-associated tremor (present in both male and female patients) or fragile X premature ovarian insufficiency (present in female patients) after the age of 50 years., In fact, premutation females are at a high risk of having a FXS child. Therefore, the molecular diagnosis of premutation and full mutation is crucial to have a healthy child and to initiate the appropriate management in full mutation individuals. Through the present study, we proposed a diagnostic algorithm combining triplet repeat primed polymerase chain reaction (TP-PCR) and methylation-specific polymerase chain reaction (MS-PCR) and validated this algorithm for the routine diagnosis of FXS. The total number of samples studied was 107. Of these, twenty were previously genotyped samples provided by another laboratory (The Centre for DNA Fingerprinting and Diagnostics [CDFD, Hyderabad, Telangana, India]. The remaining samples were those from clinically suspected cases, 59 intellectually disabled cases, 25 premature ovarian failure cases, and three prenatal samples. Two milliliters of blood was collected and deoxyribose nucleic acid (DNA) was extracted by the phenol-chloroform method. For the prenatal samples, we received chorionic villus samples (CVS) or amniotic fluid samples and DNA was extracted with QIAamp DNA mini kit (Qiagen, GmbH, Germany). All the procedures were followed in accordance with ethical standards. The primers for CGG repeat amplification are given in [Table 1]. The primer concentration used in the reaction was FXTP-For-6 pm: FXTP-Tail-6 pm: FXTP-Repeat-0.06 pm. The reaction consisted of 1X buffer, 2.5X Q solution, dNTP's (0.17 mM dATP, 0.17 mM dTTP, 0.85 mM dCTP, 0.85 mM dGTP), 5U of Taq DNA polymerase (Qiagen, GmbH, Germany) and 100 ng of genomic DNA. The total volume was made up to 15 µl. The thermal profile is given in [Table 2]. PCR products were subjected to fragment analysis through capillary electrophoresis (CE) [ABI 310]. Four microliters of amplified product was diluted in 8 µl of HiDi formamide and 0.5 µl of LIZ500. Samples which showed expansion in TP-PCR were subjected to bisulfite conversion with EpiTech Bisulfite Kit (Qiagen). Bisulfite-converted DNA was used in MS-PCR. The reaction was carried out in two vials, one for the methylated specific allele (met), and the other for the nonmethylated allele (nonmet). The reaction conditions are provided in [Table 3]. The primers were obtained from elsewhere. The amplified products were subjected to CE for accurate sizing (8 µl HiDi + 1 µl of each met and nonmet PCR product). The expected results are provided in [Table 4]. The proposed workflow for the molecular screening of CGG repeat expansion at the FMR1 locus is illustrated in [Figure 1] and the expected outcome is given in [Table 5]. First, we screened the samples for the presence or absence of CGG repeat expansion by TP-PCR. Second, the samples positive for repeat expansion, premutation, as well as full mutation, were subjected to bisulfite conversion followed by MS-PCR. The presence of nonmethylated alleles in male subjects confirmed the premutation alleles, whose size can be approximated. Likewise, in female subjects, due to the random X chromosome inactivation, either a premutation or normal allele was methylated while another allele remained unmethylated. However, full mutation male and female subjects did not have any detectable peak. Full mutation carrier female subjects were supposed to have their expanded alleles methylated; thus, methylated allele-specific PCR did not result in formation of any product, and nonmethlyated allele had a peak in the normal range. We took twenty previously genotyped samples (belonging to four female and 16 male subjects) and subjected them to the proposed protocol for genotyping. We were able to genotype all twenty samples and corroborated our results with the previously reported ones. Of the twenty patients, ten (two female, eight males) were identified as having a normal genotype based on the TP-PCR results only. TP-PCR showed characteristic stutter peak patterns that were limited to 288 bp. It also identified the number of AGG interruptions in the given samples [Figure 2]A and [Figure 2]B. These samples did not require any further workup for MS-PCR. Of the twenty patients, three (one female, two male) were assigned to the category of premutation genotype based on TP-PCR [Figure 2]D and MS-PCR assays. Premutation males had the stutter peaks beyond 288 bp. Similarly, premutation and premutation carrier females had the peaks beyond 288 bp and abrupt termination of peaks at a certain point based on a number of repeats. These samples were then bisulfite converted, and MS-PCR was carried out [Figure 3]C. The results of MS-PCR confirmed the GAA repeat number as calculated by TP-PCR and the exact size of the normal allele. We identified seven (obtained from one female and six male subjects) of the twenty samples as having the full mutation. Since full mutation alleles have >200 CGG repeats, they resulted in continuous stutter peak that diminished at the end due to the inverse relation between the size (bp) and peak intensity [Figure 2]C and [Figure 3]B. In contrast, the premutation alleles terminated abruptly at a certain point owing to the limited repeats present. The MS-PCR did not yield products due to its inefficacy in amplifying such huge CGG repeats, whereas full mutation female carriers had a peak with respect to the unmethylated allele in the normal range. Followed by validation, we applied the protocol in a clinical setup for establishing the diagnosis. Till date, 87 samples were studied, of which six (10%) of 59 samples of intellectually disabled patients were identified as full mutation positive, and one (4%) of the 25 samples of patients with premature ovarian failure was identified as premutation carrier (29 + 76 repeats). A family screening was also done to identify the carried status. One of three prenatal samples was also identified as premutation positive. FXS, fragile X tremor, and premature ovarian failure are groups of diseases related to the CGG repeat length at 5'untranslated region (UTR) position of the FMR1 gene., Therefore, counting the number of CGG repeats is crucial for a successful diagnosis. Traditionally, this process was achieved by Southern blotting. However, it was hard to differentiate the borderline allele, i.e., normal and premutation, large premutation, and full mutation alleles. This study was aimed at formulating a diagnostic algorithm that combined TP-PCR and MS-PCR assay (that is also helpful in cost reduction due to the high cost of the commercially available kit). Both the methods have been well appreciated in the diagnosis of FXS. However, it not possible to detect the size of full mutation, as well as the large premutations that are close to the full mutations. TP-PCR is a versatile tool in the identification of normal allele, premutation, and full mutation alleles. Multiple studies have validated the applicability of TP-PCR followed by CE in the diagnosis of FXS. Unfortunately, CE on ABI 310 genetic analyzer, the basic model of capillary sequencer, cannot identify full mutation alleles, due to its inability in resolving larger fragments. Since we have only the ABI 310 genetic analyzer in our setup, the combined TP-PCR and MS-PCR approach was used to diagnose FXS. 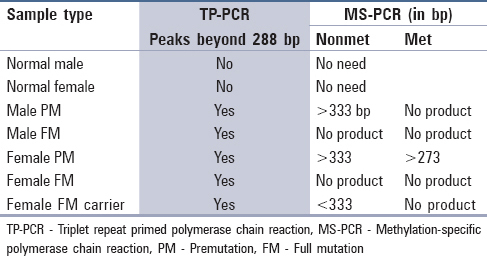 MS-PCR consists of two reactions, one for the methylated alleles and another one for the nonmethylated alleles. This method can detect only the normal [Figure 3]A and permutated alleles [Figure 3]C but not the large premutation alleles and full mutation alleles due to their inherent complexity. Therefore, the presence of premutation in female carriers is easily identifiable by this method in a process complementary to the TP-PCR, which detects only the expansion. The combined TP-PCR and MS-PCR approach can reduce the cost and time involved in the processing of samples for methylation analysis based on the fact that nearly 6% of the suspected cases of FXS are identified as being positive. Thus, performing TP-PCR could eliminate 90% of the samples in the first step, thereby reducing the sample load for methylation analysis. The present proposed protocol can identify both normal and premutation alleles effectively with accuracy. This has been demonstrated with the help of previously genotyped samples. As male subjects carry a single X chromosome, the diagnosis of FXS is straight forward in them. But, in female subjects, a thorough analysis is needed for the differentiation of differential inactivation of X chromosome in various cells. Most of the female subjects were mosaic for such an inactivation with residual methylation of the normal alleles or the premutation alleles. Therefore, the proposed protocol is capable of identifying and of estimating the size of the CGG repeats in the normal range as well as the premutation range, along with detecting the pattern of methylation in female subjects. To conclude, the present protocol can differentiate the normal, premutation and full mutation alleles effectively; while sizing of the normal and premutation alleles is also possible utilizing this technique. The authors are thankful to SGPGIMS, Lucknow for providing infrastructure; DBT, New Delhi for financial support; Dr. Samuel SS Chong, NUS, for technical support, Dr. Ashwin Dalal, CDFD, Hyderabad and Dr. Shubha Phadke, SGPGIMS for providing samples. MS is thankful to ICMR, New Delhi and DDD is thankful to CSIR, New Delhi for their fellowship. This work is financially supported by the ICMR, New Delhi, and the CSIR, New Delhi. Turner G, Webb T, Wake S, Robinson H. Prevalence of fragile X syndrome. Am J Med Genet 1996;64:196-7. Murray A, Youings S, Dennis N, Latsky L, Linehan P, McKechnie N, et al. Population screening at the FRAXA and FRAXE loci: Molecular analyses of boys with learning difficulties and their mothers. Hum Mol Genet 1996;5:727-35. Crawford DC, Acuña JM, Sherman SL. FMR1 and the fragile X syndrome: Human genome epidemiology review. Genet Med 2001;3:359-71.
de Vries BB, Mohkamsing S, van den Ouweland AM, Halley DJ, Niermeijer MF, Oostra BA, et al. Screening with the FMR1 protein test among mentally retarded males. Hum Genet 1998;103:520-2. Lachiewicz AM, Dawson DV, Spiridigliozzi GA. Physical characteristics of young boys with fragile X syndrome: Reasons for difficulties in making a diagnosis in young males. Am J Med Genet 2000;92:229-36.
de Vries BB, Wiegers AM, Smits AP, Mohkamsing S, Duivenvoorden HJ, Fryns JP, et al. Mental status of females with an FMR1 gene full mutation. Am J Hum Genet 1996;58:1025-32. Pieretti M, Zhang FP, Fu YH, Warren ST, Oostra BA, Caskey CT, et al. Absence of expression of the FMR-1 gene in fragile X syndrome. Cell 1991;66:817-22. Fu YH, Kuhl DP, Pizzuti A, Pieretti M, Sutcliffe JS, Richards S, et al. Variation of the CGG repeat at the fragile X site results in genetic instability: Resolution of the Sherman paradox. Cell 1991;67:1047-58. Comery TA, Harris JB, Willems PJ, Oostra BA, Irwin SA, Weiler IJ, et al. Abnormal dendritic spines in fragile X knockout mice: Maturation and pruning deficits. Proc Natl Acad Sci U S A 1997;94:5401-4. Sherman SL. Premature ovarian failure in the fragile X syndrome. Am J Med Genet 2000;97:189-94. Jacquemont S, Hagerman RJ, Leehey MA, Hall DA, Levine RA, Brunberg JA, et al. Penetrance of the fragile X-associated tremor/ataxia syndrome in a premutation carrier population. JAMA 2004;291:460-9. Zhou Y, Lum JM, Yeo GH, Kiing J, Tay SK, Chong SS. Simplified molecular diagnosis of fragile X syndrome by fluorescent methylation-specific PCR and GeneScan analysis. Clin Chem 2006;52:1492-500. 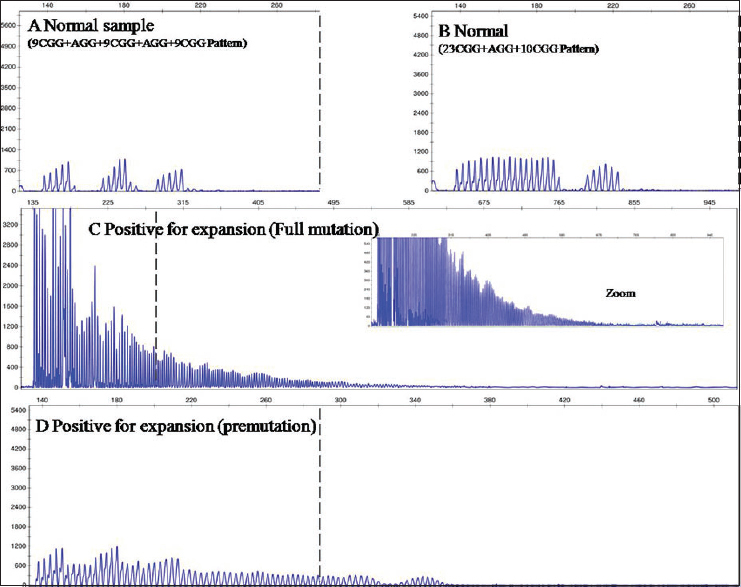 Todorov T, Todorova A, Georgieva B, Mitev V. A unified rapid PCR method for detection of normal and expanded trinucleotide alleles of CAG repeats in Huntington chorea and CGG repeats in fragile X syndrome. Mol Biotechnol 2010;45:150-4. Teo CR, Law HY, Lee CG, Chong SS. Screening for CGG repeat expansion in the FMR1 gene by melting curve analysis of combined 5' and 3' direct triplet-primed PCRs. Clin Chem 2012;58:568-79. Goldman A, Jenkins T, Krause A. Molecular evidence that fragile X syndrome occurs in the South African black population. J Med Genet 1998;35:878.